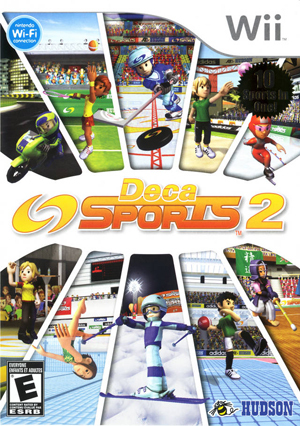 It's a top-ten all over again as Deca Sports 2 (Sports Island 2 in Europe) offers another all-you-can-play buffet of ten games anyone can enjoy. The all-around collection has something for everyone, with tennis, darts, ice hockey, motorcycle racing, synchronized swimming, speed skating, downhill skiing, bocce, kendo, and dodgeball. Multiple single and multiplayer modes offer tournaments, head-to-head matches, skill contests, and league play. Use the Team Editor to customize everything about your squad, including your team's name, logo, and colors, plus the looks and skills of the players themselves. And, just to make sure the playing field is level, beginners can learn the ropes of any of the sports in Tutorial Mode. Black screen when zooming in (cannot see target) in darts mini game. Corrected prior to 5.0-6004, likely with Hybrid XFB. The graph below charts the compatibility with Deca Sports 2 since Dolphin's 2.0 release, listing revisions only where a compatibility change occurred. This page was last edited on 31 December 2017, at 16:49.